Spring has finally arrived and I am seeing pink! 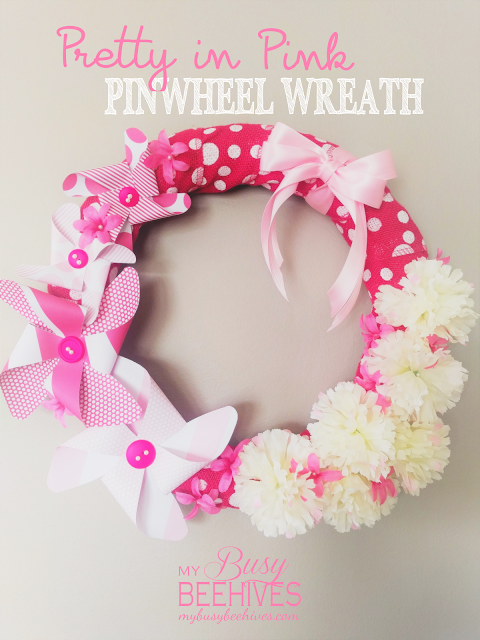 This sweet Pretty in Pink Pinwheel Wreath is the perfect way to welcome in the season, especially at our house. I have five sons and only one daughter, so we take advantage of any excuse to bring a little bit more pink into our lives. The pinwheels remind me of our lazy days in the backyard. We love watching them spin in the gentle Spring breeze. We also love seeing everything in bloom! This wreath is actually surprisingly easy to make. 1ST: Wrap your wreath form in ribbon. I am fortunate enough to have a pinwheel punch board, which is kind of like a fancy cutting board that only cuts pinwheel shapes. 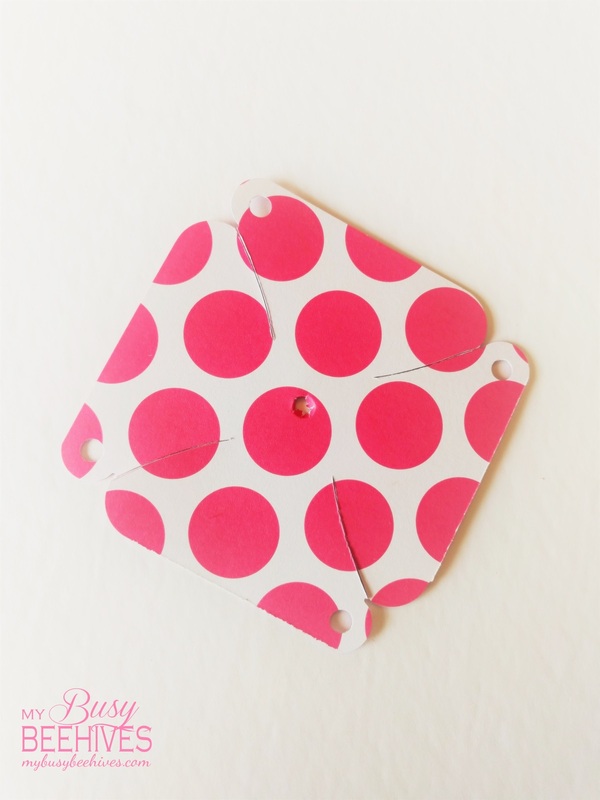 Using different sized, double-sided square card stock, I cut out my pinwheel shapes. 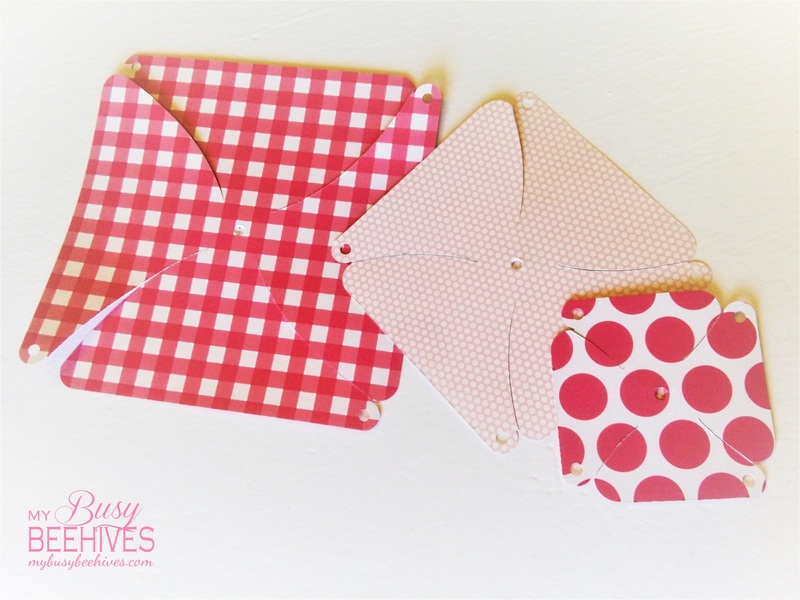 If you don't have a pinwheel punch board, do not despair! Pinwheels are actually surprisingly easy to make. Just take your square and cut diagonally from each corner from the center, careful to not cut into the center. Don't worry about the hole-punched ends like the one in my photos, the pin will go right through it without it. Fold the corners in like the picture shows. Stick a pin into the hole of a button. The pin head should prevent it from pulling through. Then stick the pin (button attached) through the center of the pinwheel, going through each folded-in corner as you go. Now stick the pin with the pinwheel attached directly onto your wreath. Tip: For now just use one of the holes on your button. You may want to rearrange/rotate/spin the pinwheels once they are pinned onto the wreath to get them positioned the way you want them. Once you have it just the way you like it stick another pin through the second hole on your button to set it in place. 3RD: Arrange your flowers on the wreath. I find that it is easiest to pull the bloom right off the wire, stick a pin into the center of the flower and attach it directly to the wreath. You can also glue the flowers on, but I like the flexibility of being able to move and rearrange them until I get a configuration I like. Sometime I go back and glue them, too. 4TH: Tie a ribbon on it! I used a coordinating ribbon to tie a bow at the top of my wreath. After I tied the bow around the wreath form, I used a couple of pins stuck into the underside of the bow loops to make sure the bow stays full and doesn't go limp. I also used a small lighter on the end of the ribbons to prevent them from fraying. I love the pink! It turned out very cute. Haven't made pinwheels in a while. Maybe it's time! Stopping by from Wonderful Wednesday. Hope you have a great one! Thank you so much. I'm rather fond of the pink, too! Last spring/summer I totally forgot to buy pinwheels and was bummed to be the only house on the block without them. This year I"m going to make my own, and perhaps even make a wreath like this! Enjoy your pinwheels! They are one of my favorite lazy day pasttimes. Pink is my favorite color! I love the pink polka dot burlap ribbon! Thank you! That ribbon has been sitting in my ribbon stash for a while now and I was so glad to finally be able to put it to good use! Your pinwheel wreath looks so fresh and fun. It's perfect for welcoming springtime. Thanks for the tutorial on making pinwheels. This is absolutely adorable. 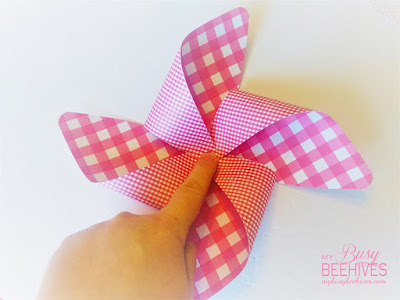 Pink is so much my favorite colour and every spring my boys each got a pinwheel spinner. It's a genius idea to pair them together. Love it. Pinning. We have to sneak in the pink wherever we can, we are so very outnumbered. Thanks for your lovely compliments and for pinning! I didn't know it was so easy to make a pinwheel!! Thank you for sharing with us at Funtastic Friday! Definitely easy. Thanks for stopping by today. This turned out cute!! Love the pink :) I've always thought pinwheels scream "fun" :) Thanks for sharing with us at Family Joy Blog linky party. Thank you! Thanks for stopping by today. Pink is one of my favourite colours and this wreath looks lovely. Thanks for sharing with us at #overthemoon link party. I'm pinning and sharing. Hooray for Pink! Thanks for pinning and sharing! I love pinwheels, this is such a pretty idea. Your Pinwheel Wreath is so pretty. I love how fun it looks. Thanks for sharing with us at Snickerdoodle. We'll be featuring this at today's party. Hope to see you there! This is so pretty Julie and so perfect for Spring <3 Thank you for linking it up to the Inspiration Galore Project Party last week. You are one of my Features tomorrow over at http://www.recreateddesigns.com. Pinned and shared. Thank you so much for the feature! I really appreciate it. This is so cute! Great idea for spring!